There was much self-congratulatory noise emanating from all parties to the Cricket Australia press conference on the new TV deal this afternoon. Channel Nine affirmed their commitment to being the international cricket station; one that underpins their entire summer schedule and something they will never relinquish without a long look. Channel Ten, with a generous bid for the international rights, and an extra chip for the BBL got what they probably wanted in the first place: their rival bid high, and they came away with a risky but promising sporting franchise they can build on. And Cricket Australia got not just a significant increase in cash, but reduced their dependence on Indian TV money from nearly a quarter of their revenue to closer to a sixth. With every day that bigger cushion looks a lot safer to fall back on. What they also managed to do is get something closer to what cricket's TV rights are actually worth. TV rights in Australia have increased significantly since the last contract was signed in 2006. There must have been some concern that they'd increased so much that no outlet would present a challenging bid. Comparing the various codes is not straight-forward. Actual value depends not just on ratings, but the length of programs, the total number of ads shown, the number of fixtures and the demographics. We can simplify a little by ignoring the demographics and the ad-rate - which is any-case, once surrounding programming is considered generally works out to around one minute of advertising for every five minutes of programming. The linked document details the basic outline of tv rights in various codes. Netball, NBL and Super Rugby were ignored because in the former cases no details of rights deals could be found, and in the latter, the international competition makes it harder to calculate. Either SBS and Foxtel significantly over-spent for the A-League or they are banking on a significant increase in ratings. The latter is likely, as the ratio of viewers to attendance for the AFL and NRL is between 15 and 30 to 1, while the A-League it is 7 to 1. Bringing that ratio in line would also bring the cost per viewer level. Because sport is a loss-leader for other programming the length of season matters. The commentators horrific play-acting aside, the tennis and cricket seasons promote less programming and take up a larger segment of the available schedule than the football codes, which may explain why they cost less per viewer. 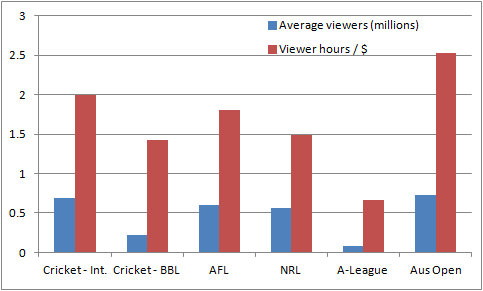 The BBL is already relatively good value on pay-tv at the price Ten spent. If the ratings increase they will have found a bargain. 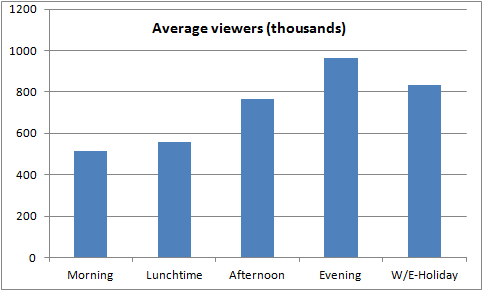 The pay-tv components of AFL and NRL drag down their average rating, while significantly increasing the programming. Cricket continues to suffer from a lack of content (roughly 200 hours versus 700+ for AFL) which is why it makes less than half the other codes per year. Another factor lowering the value in Ten's eyes is that the BBL ratings carry a significant opportunity cost in the evening time-slot. One benefit of test cricket is that even the weaker weekday morning ratings offer significantly more viewers than comparable programming. The benefits of moving into prime-time and onto the weekend - as the BBL does, and test cricket would if they ever got the right ball - are obvious here. The bulk of cricket programming lies during weekdays when people are at work. Cricket is an immensely popular sport nationally, despite its many problems with context, inequality of fixturing and troublesome scheduling. The BBL deal may be seen as a bargain in five years time. It represents a significant opportunity for Cricket Australia and Channel Ten, to build up a franchise that ought to be two or three times more valuable - and probably much longer when the next tv rights package comes around. Having it separate from the broader cricketing public on Channel Nine may make that harder in the short-term, but will also allow it to promote a separate coherent identity. Conversely, Ten's record with sport is abysmal and if they can't increase the ratings they will have over-paid for something that will fill their prime-time schedule and not rate. As changes to the sporting landscape go, this is the biggest since the founding of the A-League. The next five years will bear watching.